Pink Ribbon Lanyard "Find the Cure"
This is a 30" Lanyard/ Keychain Necklace. The Lanyard is pink with the words "Find the Cure" in white and pink ribbons going around the lanyard. 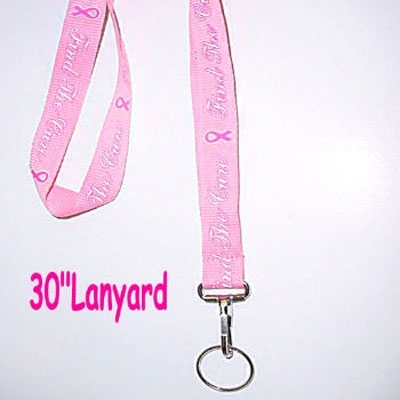 This is a great lanyard to hold your credentials for your breast cancer walks, or a great way to keep track of your keys. Makes a great gift for your sponsors, or for teachers and nurses.